A special way to say Happy Birthday to your favorite birthday girl! Delectable butter cookies, hand decorated and arranged into a special bouquet. Our cookies are handmade Vanilla Sugar Shortbread Cookies freshly baked and iced within hours of being out of the oven. 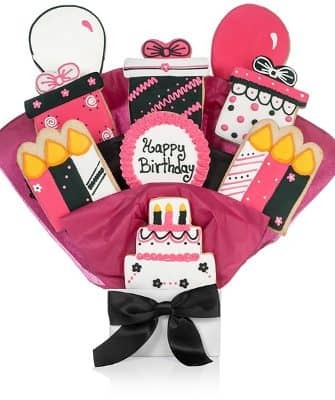 Let's think outside the cake box and enjoy our Birthday Girl bouquet. There's enough excitement to go around. This popular assortment is a great gift for a Birthday Girl and features brilliantly hand decorated and hand iced Cakes, Balloons, Gifts and Birthday Candles. Who needs a cake when you can have presents, cake and cookies all in one? !